A strong substructure indicates the quality of a deck. KlevaKlip’s joist connectors have revolutionised how you can attach joists to bearers. The flexible, sturdy connectors are a must for the deck installation kit of any professional handyman or DIY deck builder. Made from Fibre Reinforced Engineered Polymer (FREP), this robust connector is one of a kind. No wonder this connecting bracket is quickly becoming the preferred fastening method of many deck builders. KlevaKlip’s joist connector makes the set-out and construction of your substructure a breeze. KlevaKlip joist connectors are designed to attach 45mm width wide joists to 70mm, 90mm & 45mm width wide bearers. The KlevaKlip decking joist connector is best paired with Trex composite decking for a long – term, low – maintenance solution. 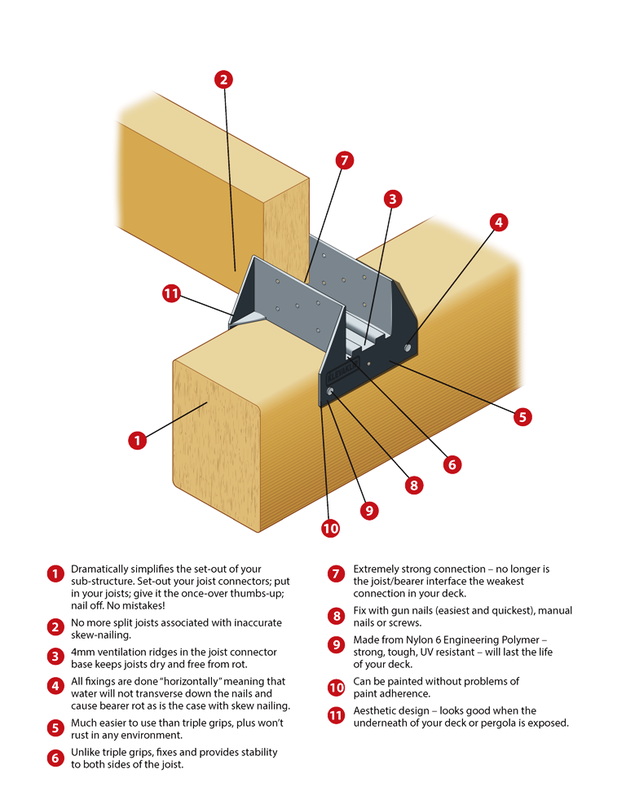 Klevaklip joist connectors can guarantee that the joist to bearer connection will keep your deck’s substructure rock-solid. Well ventilated; designed to allow your timber or composite decking boards, metal joists and bearers to breathe. WCT Distributors are proudly bringing KlevaKlip to WA. As a retailer of decking products and the sole distributor of Klevaklip in WA, WCT takes pride in all its offering to the Perth deck builders and DIYers. We sourcing only the best building systems from decking construction suppliers, both locally and from around the globe.